Are you ready to indulge in some serious beach downtime in one of the most sough-after destinations on the planet? 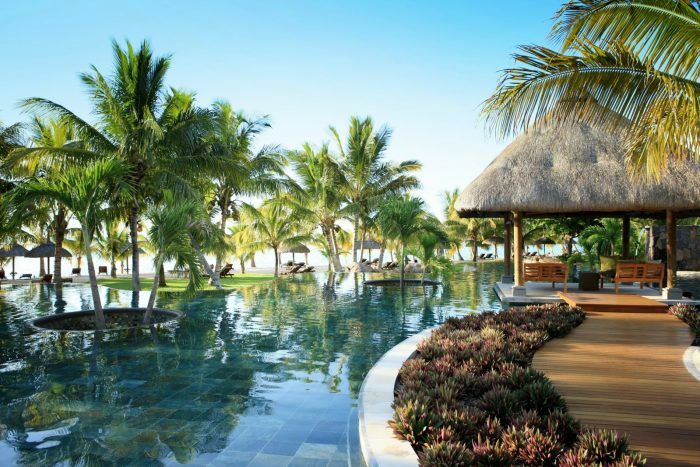 LUX Le Morne Mauritius offers you the ultimate chill out location in the lap of luxury. The resort area, in southern Mauritius, is classed as a UNESCO World Heritage Site along with close by Le Morne Brabant Peninsula and the Black River Gorge National Park. Flanked by a backdrop of rugged dramatic Le Morne mountain and lagoon-facing beaches, exotic locations don’t come much more fantastic and well-preserved than this. In a place abundant in natural beauty, the LUX Le Morne also provides a wealth of facilities and mod cons to make your stay as fulfilling and comfortable as possible. The resort amenities include four swimming pools, a gym, spa, boutique shop, pool tables, hair salon, library and games room. There is a choice of bars and four restaurants, where you can sample Thai, Mediterranean, local or international flavours with great wine and drink menus to match, all served up in glorious surroundings. A large spa complex featuring eight double shower rooms, a Vichy shower, outdoor massage kiosk, steam room, sauna, whirlpool, infinity pool and hairdressing salon. LUX Me Fitness – Modern exercise facilities including body building, stretching and cardiovascular machines and equipment. There is a range of water sport opportunities including windsurfing, water skiing, pedal boats, kayaks, snorkeling, glass bottom-boat, aqua gym, diving, speedboat and bi-game fishing. Keep active on dry land with a range of activates including, beach volleyball, mountain bikes, golf, tennis and bocci balls. After the busy period of wedding planning and festivities, newlyweds are in need of a little TLC. With this in mind a honeymoon at Lux Le Morne in illustrious Mauritius is the ultimate pick-me-up destination. The resort prides itself on its attention to detail and friendly staff for whom nothing is too much trouble. Resting effortlessly at the edge of the Indian Ccean this remarkable tropical locale seams together cyan skies and turquoise waters interrupted only by soft sandy beaches and colourful foliage. Couples will enjoy the supreme natural environment with peaceful swims and barefoot walks, and the chance to encounter dolphins native to the area. The Kitchen – The Kitchen is the main restaurant serving international and local dishes in buffet style from morning till evening. The Beach – A Mediterranean restaurant with themed evening dinners and a la carte lunches. East – Savour aromatic flavoursome Thai cuisines at East. The Bar – A lounge bar stocked with all your favourite tipples, showing live music every evening. Café LUX – Café LUX’s menu comprises of fresh coffees and sweet treats to be enjoyed with free magazines and newspapers. ICI – A Gourmet ice-cream parlour with a wide choice of flavours. ILOT & Oasis – Two cool pool bars offering light snacks, refreshing drinks and cocktails.